Swimming (泳ぎ, Swimming) is an action in Super Smash Bros. Brawl, Super Smash Bros. for Wii U, and Super Smash Bros. Ultimate that gives a player mobility in water. Swimming generally has two animations: a normal floating animation and a more panicked "drowning" animation. A player that enters water will float for a while, enter the drowning animation, and eventually sink. Swim time is determined by damage; the character is irrelevant. In Super Smash Bros. Melee and Super Smash Bros. for Nintendo 3DS, there is no swimming mechanic; instead, characters simply fall through water. In the original Super Smash Bros., there is simply no water to facilitate a swimming mechanic. The time for which players can continue to swim is determined by how much damage has been received: the more damage accumulated, the less time the character can stay afloat before drowning. Drowning causes the character to sink through the water while immobile and be KO'd. It cannot be stopped once started. All characters have the same base swim time and can drown, regardless of swimming ability or underwater survivability in their own games. However, characters like Squirtle swim much faster than characters such as Sonic. 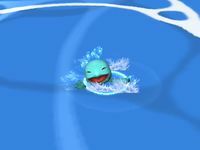 Characters can swim for a maximum of 4 seconds, after which they can remain afloat floundering for an additional 2.5 seconds, when they will enter a "panicking" animation. The 4-second clock is shorter for higher-damaged characters, at a rate of 1 second for each 24% damage. As a result, characters at 96% damage or higher will enter the flailing state immediately on surfacing. The swim time in the SSE can be increased by using stickers. In Ultimate, equipping any Spirit with the "Swimmer" ability sets swim time to infinite, allowing characters to stay in water for as long as they like. Swim times are only reset by landing on dry land; simply jumping out of the water momentarily will not give the player any extra time (although it will stall the amount of time). However, it does reset it to the "panic" stage. The player can continue jumping out of and back into the water infinitely and never drown, provided they don't wait over the normal panic limit. Even characters with 999% damage have 2.5 seconds before drowning to jump, making it difficult to forcibly drown an opponent. Apart from moving, characters can only jump when swimming, which mostly acts as their ground jump. Only Olimar's Blue Pikmin can swim, and the rest will drown after a few seconds (Brawl) or about a second (Wii U) in deep water if not called back. Red Pikmin die immediately. If a character is trapped in an egg, they can sink to the bottom and be KO'd if they don't break out in time. In Ultimate, certain characters with a weakness to water will take a small amount of damage (about 0.3% per 20 frames, stopping at 300%) while swimming. This includes Charizard, Sonic, Inkling, and Incineroar. In some cases, a character can skip the swimming animation and go underwater. The swim timer does not take effect in this state. A character hit downwards towards water by a meteor smash may be KO'd outright if their downwards speed is too fast for them to swim to the surface. A character may only move from side to side while underwater, allowing for easily chained meteor smashes against a character who has fallen in. If Wario is riding his bike, he will fall right through the water. Letting go of the bike will cause him to swim and his bike to sink. Characters using Final Smashes (including some transformations such as Giga Bowser) will fall through water and be KO'd. The exception is Mr. Game & Watch's Final Smash, Octopus, which allows him to float permanently on top of the water and be unaffected by currents during the entirety of Octopus, including those on Jungle Japes. In Brawl and Smash 4, if a character is using a longer tether recovery, they will pass through the water as if it's not there until the character stops grabbing the edge. In Ultimate, the tether will break and the character will begin swimming when they touch the water. In the Subspace Emissary, if Player 2 sinks directly through the water after they panic, this will trigger an automatic Space Jump. If a character with a stall-then-fall down aerial short hops out of water, then immediately uses the said attack, they will fall a great distance before coming afloat, allowing water stalling. This also works with Pikachu's Quick Attack. This works because if the character jumps low enough, they will be considered to be at the top of the water, so the character will fall for 1 or 2 frames, coast down for any amount of time (depending on the velocity of the attack), and come back up. If any character is KO'd in Stamina Mode and enters water, they will tumble straight through the water. In some stages in the Subspace Emissary (such as The Ruined Zoo), characters can swim longer than usual. Enemies, as they cannot swim, simply fall through the water and die. Oddly, floating and flying enemies die immediately on contact with swimmable water. Hanenbow has water above its bottom blast line, but swimming in it is not possible; characters will just fall through it. Pac-Land has water in one area, but swimming is not possible in the water on this stage. As one tip says: "Unlike in other stages, you can't float at all in the water here. You'll fall through it like it's not even there, so be careful not to belly flop to a KO!" Also returning are Princess Peach's Castle, Hanenbow, Balloon Fight, Paper Mario, and Pac-Land, which feature non-swimmable water above the bottom blast line. When a character is underwater, their drowning timer will not decrease. As a result, if a character can stay underwater (such as by diving underneath a hard platform that prevents a character under it from surfacing), they can stay submerged in water indefinitely. Hiding underneath the back of the Pirate Ship in this way is known as "rudder stalling", and while it can only last until the cyclone reappears, it is strong enough to be a major factor in banning the stage in almost all rulesets. Several characters who have enhanced swimming capabilities, and can even breathe and live underwater, in their home series, so would not be expected to be able to drown, can drown in the Super Smash Bros. series. Despite Squirtle and Greninja being Water-type Pokémon with enhanced swimming capabilities, even being able to breathe underwater, they can still drown. Several characters who are unable to swim in their home series can swim in the Super Smash Bros. series. Up until Super Smash Bros. Ultimate, these characters had no penalties for touching water or swimming; however, all the listed characters now take constant damage when swimming in said game. All those listed also have a panicking animation once swimming, though once they start to drown they'll be panicking even more. Charizard is a Fire-type Pokémon and is thus weak to Water-type moves. However, on multiple occasions in Pokémon media, Charizard have been shown to be capable of swimming and keeping their tail lit even when underwater, despite several of Charizard's Pokédex entries stating that it will die if the flame on Charizard's tail is extinguished. Sonic cannot swim in his own series (except in Sonic Colors, in which he can double jump infinitely in water), but he can in his Smash Bros. appearances. 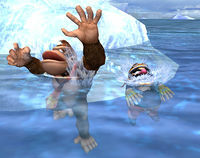 However, he is notably more frantic than other characters when he enters his drowning animation, and in Ultimate, his swimming animation is similar to his drowning animation, albeit slowed down and a differing expression. Inklings cannot swim in their own series due to having bodies consisting mostly of ink, which would cause them to dissolve and die upon contact with water. This phenomenon does not happen in Ultimate, instead taking gradual damage. Incineroar, being a Fire-type Pokémon like Charizard, shares a weakness to Water-type moves, and as such takes damage while swimming like the above mentioned characters. Drowning characters cannot be stopped during their final descent, and will even sink through solid objects. For example, it is possible for a player to drown and pass through the platforms that pick up the fighters when Wuhu Island is transitioning. This page was last edited on March 17, 2019, at 04:42.